attract locals and foreigners, drawing the attention of passersby and inviting them to savor the spirit of the place Danzon pace. 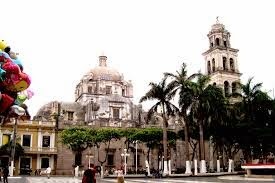 The architecture of Veracruz is deployed in a variety of styles where the colonial past and modern blend in harmony. On the one hand, the Cathedral of the Assumption and its three naves with iconic and Doric styles, construction done in 1721 and 1963 that would become World Heritage with its unique beauty. Moreover, succeeding one after the other monuments, obelisks and museums. Highlights include the Faro Venustiano Carranza, one of the buildings along with the construction of dams, breakwaters and jetties, make the Port of Veracruz Works opened on March 6, 1902 by President Porfirio Diaz. Pemex Museum, which itself stands as an artistic monument, especially the sculptures of marine scenes that are part of its design, as well as the mural expressed in a double-height ceiling where the theme is "Eagle in Flight ": her wings as ears and gears industrialized agricultural past and present emerge, while the claws imprison the sea and land in sublime communion. The Naval Historical Museum, which served as headquarters for the Naval Academy in the late nineteenth century historiography has 11 rooms, temporary exhibition hall, library and auditorium. The former Hospice of Zamora, neoclassical building that had its first stone in 1852, became since 1970 in the City Museum, featuring different aspects of culture and evolution of Veracruz and the Veracruz Institute of Culture, which since 1987 has by disseminate objective, recover and preserve the culture of the city. And how many more places that harbor a unique past and proudly display this in a society rich in history and customs! No doubt that Veracruz has become center of attention worldwide with its unique Carnival, same as every year (between the months of February and March) blends the beat of the music and colorful traditions of the people whole , giving origin to an endless party echoed in every corner of the city. For those wanting dazzled with this wonderful place, you can find discounted Interjet flights, and enjoy an experience they will never forget. Is liable for any tourist visiting the Craft Market where you can buy the most varied creations prepared from sea shells, snails, shark teeth ... and has perhaps seen close to an animal like that swimming in their natural habitat? Because if it is not, enjoy watching as fearsome creature hundreds of species and many more in Super Veracruz Aquarium, whose nine freshwater aquariums and saltwater 16 are the main attraction. But before leaving, he can not miss San Juan de Ulua: instead worked at different times as a fortress, wharf, prison and Palacio Municipal. No doubt this is a testament to solid rock where the history of Veracruz to the passage of the centuries is condensed and, why not, where somehow has its origin. And rest assured that here will never be short of new experiences and fond memories, because therein lies the magic of a wonderful place: port always welcome you with open arms and no doubt will be recorded in the hearts of those who had the lucky to feel the heat at the immensity of the sea and the sky, especially at sunrise.